Google is doing the driverless thing. Tesla is doing the driverless thing. Apple is doing the driverless thing. This is going to be the world. So a question for a tech company is, do you want to be part of the future or do you want to resist the future? Driverless cars are the future. If that doesn't appeal to you, blame automation; blame Silicon Valley. Don't blame Uber. Now, Travis Kalanick's vision of the future may indeed come to fruition, and taxi drivers, long-haul truckers and (eventually) train conductors may in fact need to begin looking for new jobs. But what struck me about his oft-repeated response was the way that it so subtly but effectively controlled the narrative around automation and the future. By maintaining that the future is predetermined, Kalanick manoeuvred us, the public, into a position where we, too, are seemingly left with just two choices: resist that future, or embrace it. Of course, this is not the case: every technological advance involves human agency, and so there are choices available to us, but Kalanick's response circumvents this. We shouldn't get in the way of technological determinism. In the context of politics, Patricia Dunmire has written that such language works to "supplant the notion of the future as the site of the possible with a conception of the future as inevitable". This then limits the ability of people to "imagine, articulate and realise futures" different to ones handed down by those in power. My concern is that if we allow tech companies to similarly cast the future as determined, they can avoid engaging in a meaningful discussion about the consequences and implications of new technologies like self-driving cars, artificial intelligence (AI), or machine learning. Unsurprisingly, Kalanick is far from the first industry boss to frame the future of automation in this way. Industrialists, engineers and scientists in mid-20th-century America deployed many of these same narratives in similar attempts to control the discourse around technology and 'the future'. Examining how these narratives were deployed in the past can offer insight into how they are currently being used today – and what to do about it. 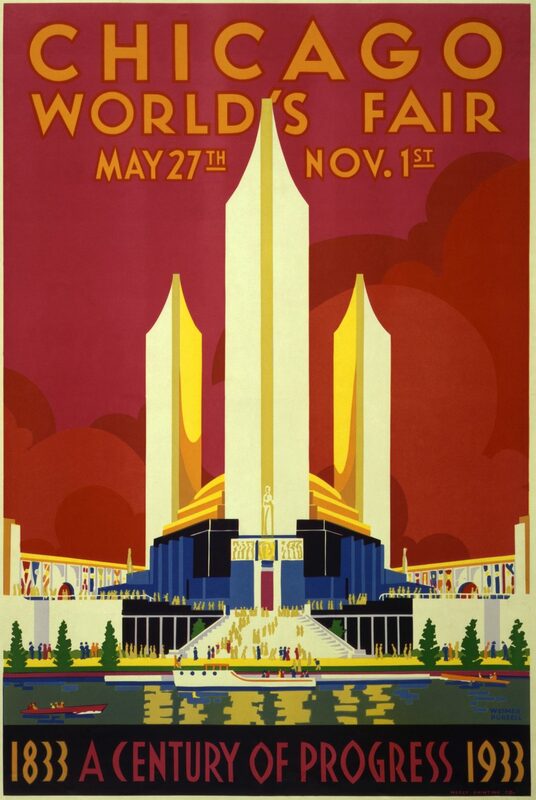 The planners of the 1933 Chicago World's Fair, for instance, took quite a deterministic view of the relationship between society and technological advance, which the guidebook for the fair encapsulated, in one of the great chapter headings of the 20th century: 'Science Finds – Industry Applies – Man Conforms'. The guidebook went on to explain: "Science discovers, genius invents, industry applies, and man adapts himself to, or is moulded by, new things… Individuals, groups, entire races of men fall into step with the slow or swift movement of the march of science and industry." As well as conjuring images of a certain goose-stepping hyena scene from The Lion King, this description casts technological progress as the prime mover within society. Technological advancement is imagined as a train travelling briskly down the tracks toward a singular destination – a destination that will not only be revolutionary but unquestionably beneficial for all. The public just needs to climb aboard. The National Association of Manufacturers put its own unique spin on this well-worn metaphor in 1954 when it said: "[G]eared to the smooth, effortless workings of automation, the magic carpet of our free economy heads for distant and undreamed of horizons. Just going along for the ride will be the biggest thrill on earth." Yet, for as much as technological advances are often framed as revolutionary, they are also often framed as simply evolutionary. While new automative technologies like electric limit switches, photoelectric controls, or microprocessors were described as revolutionary advances that would greatly benefit industrialists and consumers alike, these same advances were also described as merely the next step in the slow and gradual evolution of industrial technique. Adopting this approach, a 1955 General Electric film/advertisement entitled This is Automation described recent advances in automation as the latest in long line of "natural evolution in industry" that had "worked to the advantage of everyone". This not only served to naturalise automatic processes at a time when the US Congress was meeting to discuss concerns about automation, it also served to rewrite the history of automation extending backward to the beginnings of the Industrial Revolution. "Before the word automation was coined", the film explained, advances in manufacturing "seemed funny or fearful, depending on the viewpoint… The trouble was, some people thought of automation as a sudden thing – a revolutionary idea. But it isn't! It began nearly two hundred years ago". The message, then, was that automation was not new, and therefore need not be foreboding; what had benefited society in the past would benefit society in the future. After all, did not labourers in the 1950s enjoy better working conditions, shorter hours, and greater purchasing power compared to their equals a century before? The 'natural evolution' of automation would ensure that labourers in 2050 would be similarly better off. Such an account, however, makes no mention of the decades of work done by unions to secure those benefits or the legislation passed to ingrain certain rights as law. Two hundred years of automation are made to seem almost automatically beneficial. As a result, we're led to believe that the future of automation will require equally little in the way of regulation or action by labour unions. In a very real, very Orwellian sense, industry bosses who took such an approach were able to control the story of how automation unfolded in the past, and how it would unfold in the future. In the words of the Party: "Who controls the past controls the future; who controls the present controls the past". According to many mid-20th-century industry bosses, the only thing that could derail this better future were the pessimists and critics – the people who wanted to saddle America's economy with unnecessary and burdensome regulation. It was Henry Ford himself who, in a 1939 New York Times article celebrating the opening of the New York World's Fair, lambasted those who would resist the onward march of science. "Despite every restriction that can be placed on it by so-called 'reformers'," Ford wrote, "the quest will continue – invention will go forward." In one of the most unintentionally delightful films from the 20th century the industrial manufacturing firm, Westinghouse, set out to confront these 'so-called reformers' with a feature-length film, The Middleton Family at the New York World's Fair, released in 1939. Part drama and part corporate advertisement, the film sets up a struggle for the soul of the Middleton's cherubic young son, Bud. On one side is Nikolas Makaroff, an intellectual, European, artist type who is partial to quoting Karl Marx and refers to automation as "Frankenstein's monster". On the other is Jim Treadway, a good ol' American boy who passed up a chance to play pro (American) football in order to work for Westinghouse and who believes in the power of science, industry, progress and the American way. For good measure, the screenwriters also include a love triangle between Makaroff, the Middletons' daughter, Babs, and Treadway (her former flame). The film opens with a gloomy radio announcement about the lack of jobs in Depression-era America, after which Bud laments his luck at being born into joblessness. "Maybe it is difficult", Mr Middleton interjects, "but it's worse to be a quitter… You've heard all the talkers, now I'm going to show you the doers!" And with that, the Middletons are off to the fair. Mr. Middleton:	"Tell me Jim, do you honestly believe industry can make enough jobs in the future to take care of the young people that are coming along?" Jim Treadway:	"I think the problem's going to be the other way around. Industry will make so many jobs there won't be enough people to fill them." Jim Treadway:	"So you don't believe me do you?" Bud:	"From all I've heard…"
Jim Treadway:	[Crossing arms] "You're liable to hear anything these days. Are you willing to sit back and let a lot of self-appointed leaders do your thinking for you?" Bud:	"Well they believe we're on the skids…"
Jim Treadway:	"Yes, and the men who built this fair believe the opposite. And what's more they back up their belief… with two hundred million dollars' worth of facts." Bud:	"Well maybe the other side would, too, if they weren't busted." Jim Treadway:	"And they'll stay that way. Until they learn that prosperity and pessimism don't travel together. But they're like you, Bud: they don't like facts." Bud:	"Oh, I don't mind them, Jim." Jim Treadway:	"Good, then I'll introduce you to a few. Come along." [Taking him warmly by the shoulder, Jim leads Bud off stage left]. After an entire day of learning about the economic benefits of photoelectric cells, triodes, and oscilloscopes, Bud has had enough of pessimism. And after Nikolas Makaroff is exposed as a hypocrite, liar and coward, Babs returns to Treadway. The film and the fair for which it was produced are noteworthy for the way that the industrial, scientific, engineering, and business communities came together to directly combat the negative press surrounding technological advancement. In her analysis of the fair, the historian Sue Bix writes: "In defining the future as a period characterised by wonderful revolutions in production, exhibitors effectively excluded discussion of any accompanying cost to workers." By doing so, they were able to avoid taking any substantive steps to address the concerns of labour unions and government bodies. The fact that industry bosses from Henry Ford to Travis Kalanick have been deploying similar rhetoric for more than a century speaks to the success of these narratives, and to the extent to which these same industry bosses have largely been able to avoid engaging in meaningful discussions about the impact of automative technologies. Indeed, their success makes it difficult to even imagine any alternatives. Such framing, according to the philosopher Elizabeth Grosz, "annihilates any future uncontained in the past and present". Thankfully, however, a small number of writers and activists from this period offered up a few alternatives. Take the example of the United Auto Workers' (UAW) union. A few years after Congress met to discuss concerns about automation and General Electric released its supporting film This is Automation, the UAW put out its own film on the topic of automation, Push Buttons and People. The film challenges determinist framings of technological advancement by asking, "Will whatever happens, happen automatically? Can we do anything?" Given that their jobs were on the line, it is understandable that the UAW described automation not as a train headed toward better shores, but as "a word to strike terror in any human heart" and as something to be confronted and 'tamed'. More importantly, however, the UAW also framed technological advancement as something that was contestable and open to discussion rather than predetermined. The film made a point of attempting to draw viewers into a conversation about how to proceed. Or take the ecologically-minded writer Peter van Dresser who, in a 1939 article in Harper's, rejected Aladdin-esque framings of technological advancement. The American people, according to Dresser, were all too ready to "talk and think as if Scientific Technology [sic] were a kind of wilful genie whose gifts we must gratefully accept while we accommodate ourselves as best we can to his bad habits." Seeing to the social health of the nation would be impossible, Van Dresser argued, so long as people continued to accept "utterly without criticism the blueprints for America's technological future formulated by the industrial empire-builders." Yet despite these calls to action, America exited the 20th century having never settled these debates about the impact of automation. According to Sue Bix, what was missing was both the willpower to challenge dominant discourses about progress and a clearly articulated vision of how the public might be given a say in the development and adoption of automative technologies. As we continue to grapple with more questions about technological advancement today, now is the time to challenge dominant discourses and articulate our alternative visions of the future. This will require taking steps to encourage an informed dialogue between tech companies, governments, non-profits, and the public. Along these lines, the Government Data Science Partnership recently developed a Data Science Ethical Framework which aims to help policymakers and data scientists "think through some of the ethical issues which sit outside the law." Through public workshops and online surveys members of the public were encouraged to participate in the development of this framework. The partnership even commissioned the Data Dilemmas app in an attempt to provide members of the public with "a way of learning about data science and the ethical trade-offs that government has to make in designing data science projects." It is far from perfect, but it is a start. On the industrial side, Google, Amazon, IBM, Microsoft, and Facebook joined forces this September to create the (absurdly-named) Partnership on Artificial Intelligence to Benefit People and Society. The partnership was formed with the expressed purpose of serving as "an open platform for discussion and engagement about AI and its influences on people and society". The coming years will tell whether this is a genuine attempt to engage in meaningful dialogue or simply an effort to mollify public fears. Challenging these dominating narratives could also involve setting up dedicated commissions to examine the impact and implications of technological innovations. In a promising move, the House of Commons recently recommended that a commission on Artificial Intelligence be established at the Alan Turing Institute. With a remit to examine the "social, ethical and legal implications of recent potential developments in AI" and ensure that new AI systems are developed responsibly and transparently, the new commission would seem to be a step in the right direction. We need more efforts such as these, and we need them to become the rule rather than the exception. Otherwise, as Grosz warns, we may find ourselves implicated in futures not of our making. Who will succeed in the new machine age?